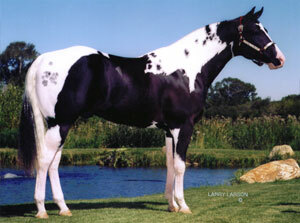 Sonnys Amigo Bar, affectionately called "Amigo," is a black tobiano stallion with inkspots. He is homozygous for both the tobiano and black genes, with some legendary bloodlines, including Sonny Dee Bar, The Ole Man, Leo and Three Bars. Amigo was placed in the top ten at the APHA World in Amateur Halter and reigned as the 1998 World Color Champion. Amigo finished in the top five in both Heading and Heeling at the 2002 National Western Stock Show, earning five Heeling points and his ROM in Heading. With the three Steer-stopping points he earned at the 2001 NWSS, Amigo proves he is a very attentive athlete with a lot of agility. Thanks to Dave and Linda Durbano of Snowy Range Ranch (Wyoming) for allowing me to display this photo of their superb stallion.